Templates are an excellent tool to provide your customer with predefined customizations allowing them to give him/her a personal touch or to completely overshadow them. 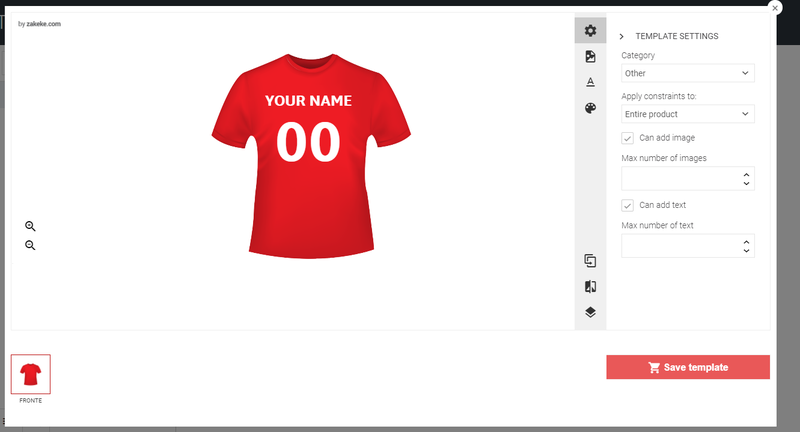 The user can only customize this type of t-shirt and not start from a blank one. The name has a maximum number of characters. The player number must always be 2 digits with a filling '0' (e. g. 01, 04, 12). The user cannot in any way move, rotate, enlarge or remove the name and number. The user may not add text or images anywhere. Zakeke templates allow you to manage all these things. Templates in Zakeke are linked to a product and are divided by categories. The creation of categories is not mandatory and all templates not associated with any category end up in a fictitious category called "Others". In the popup that opens we will have a fully functional version of Zakeke. We draw what we want as a normal customer would do and press "Save template", from now on the user will have the opportunity to select this template and choose it as a starting point for its customization. 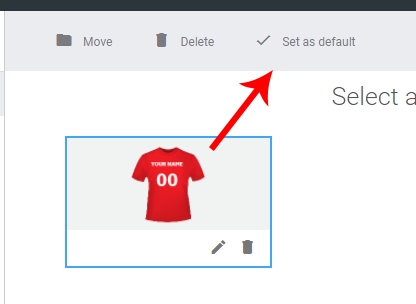 To make this template default, select it and click on "Set as default". This way this template will be loaded as soon as the user customizes the product. 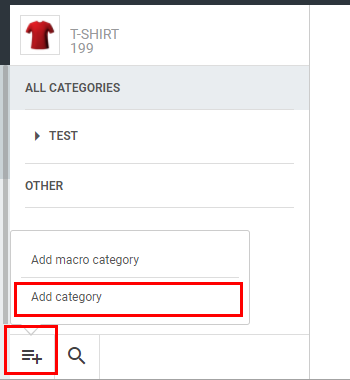 If you enable the synchronization (you can find it in the limits per product), all the elements added will be automatically copied on all the other sides by default. 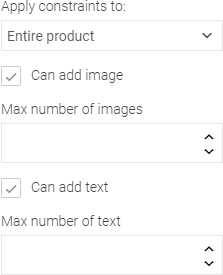 While you create a template, if you select a text or image, a new padlock icon will appear, allowing us to apply various settings on that single item. Just apply one or more tips to prevent moving, rotating, zooming, enlarging, deleting, changing fonts or text, etc. You can also mark an element to be edited before buying (e.g. a name placeholder), by checking the 'Mandatory to edit' field. In particular, for the text, there are additional settings regarding the number of characters and padding. If you set a minimum number of characters, it is necessary to indicate in the field "Padding string" which will be the filling character (in our example, the character' 0'). If you enable the synchronization on an element, it would be automatically copied on all the product sides. Indicate the name in the dialog box that appears and press "Save". 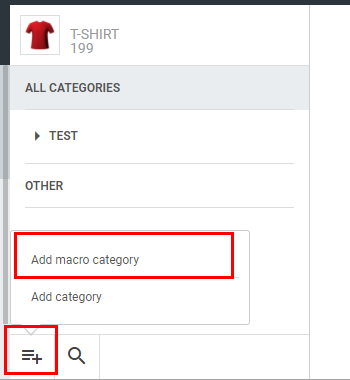 Then add a category by clicking "Add" => "Add category" again in the sidebar, and choosing which macro category should belong to.